The Prophet Daniel and the Three Children were all descended from the royal tribe of Judah In the year 599 before Christ, in the reign of Joachim, who was also called Jechonias (I Chron. 3:16, and II Chron. 36:8), while yet children, these righteous ones were led away as captives into Babylon together with the other Jews by Nabuchodonosor. He singled them out from among the other captives to serve him, and renamed them thus: Daniel was named Baltazar; Ananias, Sedrach: Misael, Misach; and Azarias, Abednago. They were reared in the royal court, and taught the wisdom of the Chaldeans; and after the passage of three years, they surpassed all the Chaldean sages (Dan. 1). Thereafter, Daniel, being still a lad, interpreted that mysterious image seen by Nabuchodonosor in a dream, an image that was composed of different metals, but was shattered and ground to dust by a certain stone which had been hewn out of a mountain without the hand of man. This vision clearly portrayed through the mountain the height of the Virgin's holiness and the power of the Holy Spirit which overshadowed her. Through the image of the Stone, Christ was portrayed, Who was seedlessly born of her, and Who by His coming as the Godman would shatter and destroy all the kingdoms of the word, which were portrayed through the image; and He would raise them that believe in Him into His Heavenly Kingdom, which is eternal and everlasting (ibid. 2:31-45). Thereupon, he signified in prophecy the time of His appearance in the Jordan, the beginning of His preaching of the Gospel, the time of His saving Passion, and the cessation of the worship according to the Mosaic Law, (ibid. 9:14-27). He portrayed most excellently the majestic and dread image of His second coming, presenting by means of words, as with living colours, the fiery throne which shall be set, the Eternal Judge Who shall sit thereon, the river of fire that shall flow forth before Him, the calling to account before the impartial judgment seat, the opened books of each ones deeds, the thousands upon thousands of them that minister to Him, and the ten thousands of them that stand in His presence (ibid. 7: 9-10). Daniel (whose name means "God is judge) was called "man of desires" by the Angels that appeared (ibid. 9:23), because he courageously disdained every desire of the body, even the very bread that is necessary for nourishment. Furthermore, he received this name because, in his longing for the freedom of those of his tribe, and his desire to know their future condition, he ceased not supplicating God, fasting and bending the knee three times a day. Because of this prayer he was cast into the den of lions, after he had been accused by his enemies as a transgressor of the decree issued through the proclamation of the king, that no one should worship or ask for anything from God or from men for thirty days, but only from the king. But having stopped the mouths of the lions by divine might, and appearing among them as though he were a shepherd of sheep, Daniel showed the impious the might of godlinness (ibid. 6:1-23). As for the Three Children, Ananias ("Yah is gracious"), Misael ("Who is what God is? ), and Azarias ("Yah is keeper"), since they refused to offer adoration to Nabuchodonosor's image, they were cast into the furnace of fire. They were preserved unharmed amidst the flames - even their hair was untouched - by the descent of the Angel of the Lord, that is, the Son of God. 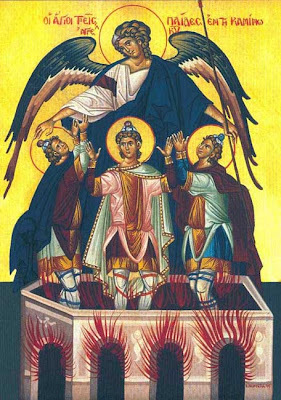 Walking about in the furnace, as though in the midst of dew, they sang the universal hymn of praise to God, which is found in the Seventh and Eighth Odes of the Holy Psalter. And coming forth therefrom, without even the smell of the fire on their clothes (Dan. 3), they prefigured in themselves the Virgin's incorrupt giving of birth; for she, on receiving the Fire of the Godhead within her womb, was not burned, but remained virgin, even as she was before giving birth. In the eighteenth year Nabuchodonosor made a golden image; its height was sixty cubits and its breadth was six cubits; and he set it up in the plain of Deοra, in the country of Babylon. And he sent to gather all the governors and generals and magistrates and chiefs and princes, all those with authority, all the governors of countries to come to the dedication of the image. And they were gathered, the magistrates, governors, generals, chiefs, great princes, those with authority, all the governors of countries for the dedication of the image which Nabuchodonosor the king had set up; and they stood before the image. And the herald cried loudly: To you it is ordered, peoples, tribes, languages, at what hour you shall hear the sound of trumpet, pipe, harp, sackbut, psaltery and every kind of music, you shall fall down and worship the golden image which Nabuchodonosor the king has set up. And any one who does not fall down and worship, at that hour shall be cast into the burning furnace of fire. And it came to pass that when the people heard the sound of trumpet, pipe, harp, sackbut, psaltery and every kind of music, all the peoples, tribes and languages fell down and worshipped the golden image which Nabuchodonosor had set up. Then certain Chaldean men approached and accused the Jews and they spoke and said to king Nabuchodonosor: O king, live for ever! You, O king, have given an order that everyone who hears the sound of trumpet, pipe, harp, sackbut, psaltery and every kind of music and does not fall down and worship the golden image, shall be cast into the burning furnace of fire. There are Jewish men, whom you have placed over the works of the country of Babylon, Sedrach, Misach and Abdenago, who have not obeyed your order, O king, and do not serve your gods and who do not worship the golden image which you have set up. Then in rage and anger Nabuchodonosor ordered Sedrach, Misach and Abdenago to be brought; and they were brought before the king; and Nabuchodonosor answered and said to them: Is it true, Sedrach, Misach and Abdenago that you do not serve my gods, and do not worship the golden image that I have set up? Now therefore, when you hear the sound of trumpet, pipe, harp, sackbut, psaltery and every kind of music, you are to fall down and worship the golden image that I have set up; and if you do not worship, in that hour you will be cast into the burning furnace of fire. And who is the god that will rescue you from my hands? Sedrach, Misach and Abdenago answered king Nabuchodonosor: We have no need to answer you over this matter; for our God, whom we serve, is in heaven, able to rescue us from the burning furnace of fire and he will from your hands, O king, because we will not serve your gods and we will not worship the golden image that you have set up. Then Nabuchodonosor was filled with rage, and his countenance was changed towards Sedrach, Misach and Abdenago, and he ordered the furnace to be heated sevenfold, so that it should burn to the uttermost; and he ordered his strongest men to fetter Sedrach, Misach and Abdenago and to cast them into the burning furnace of fire. Then the man bound then with their coats, caps, leggings and other clothing and they were cast into the middle of the burning fiery furnace, since the word of the king was pressing; and the furnace was heated exceedingly, sevenfold. And these three, Sedrach, Misach and Abdenago, fell bound into the midst of the burning furnace of fire, and they walked in the middle of the flame, praising god and blessing the Lord. And Azarias prayed thus; and opening his mouth in the middle of the fire he said: Blessed are you, O Lord, the God of our fathers: and praised and glorified is your name to the ages. For you are just in all that you have done for us. And all your works are true, and your ways are right, and all your judgements are true. And judgements of truth you have executed in all that you have brought upon us. And upon Jerusalem the holy city of our fathers. Because in truth you have brought all these things upon us, because of our sins. Because we have sinned and committed iniquity in departing from you, and we have sinned in all things, and we have not obeyed your commandments, nor kept them, nor have we done as you commanded us, that it might be well with us. And all that you have done to us, and all that you have brought upon us, you have done with true judgement; and you handed us over into the hands of our lawless foes, hateful rebels, and to an unjust king, the most wicked in all the earth. And now we cannot open our mouth; we have become a shame and disgrace to your servants, and to those who honour you. Do not hand us over for ever, for your holy name’s sake, and do not annul your covenant, and do not withdraw your mercy from us, for the sake of Abraham your beloved, and Isaac your servant, and Israel your holy one. To whom you said that you would multiply their seed as the stars of heaven, and as the sand that is by the shore of the sea. Because, Master, we have become smaller than all the nations, and we are humbled in all the earth to-day because of our sins. And at this moment there is neither prince, nor prophet nor leader; neither holocaust, nor sacrifice, not offering, nor incense; no place to make an offering before you and to find mercy. Yet with a contrite heart and with a spirit of humility may we be accepted, as though with holocausts of rams and bulls and tens of thousands of fat lambs, so may our sacrifice be acceptable before you to-day, and may it be perfected behind you; because there is no shame for those who trust in you. And now we are following you with our whole heart, and we fear you, and seek your face; do not put us to shame. But do with us according to your fairness, and according to the multitude of your mercy. Deliver us according to your wondrous works, and give glory to your name, O Lord. And let all who harm your servants be disgraced, and put to shame from all their power, and let their strength be smashed. And let them know that you Lord, alone are God, and glorious in the whole inhabited world. And the king’s servants, who cast them in, did not cease stoking the furnace with naphtha, pitch, tow and brushwood. And the flame poured out above the furnace forty nine cubits; and it spread out and burnt up those of the Chaldeans it found around the furnace. 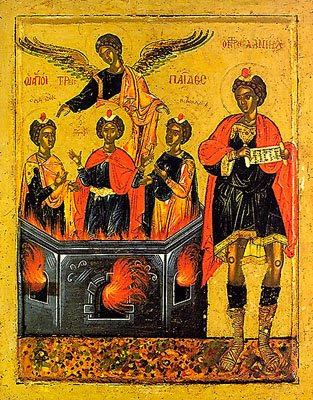 But the Angel of the Lord came down into the furnace with Azarias and his companions, and shook the flame of the fire out of the furnace. And he made the midst of the furnace as though a moist wind were whistling through it; and the fire did not touch them at all, nor hurt them, nor trouble them. Then the Three as with one voice, hymned, blessed and glorified God in the furnace, saying: Blessed are you, O Lord, the God of our fathers: to be praised and exalted unto the ages. And blessed is your glorious, holy name: to be praised and exalted unto the ages. Blessed are you in the temple of your glory: to be praised and exalted unto the ages. Blessed are you who behold the deeps and sit upon the Cherubim: to be praised and exalted unto the ages. Blessed are you on the glorious throne of your kingdom: to be praised and exalted unto the ages. Blessed are you in the firmament of heaven: to be praised and exalted unto the ages." Bless the Lord all you works of the Lord; praise, and highly exalt him to all the ages. 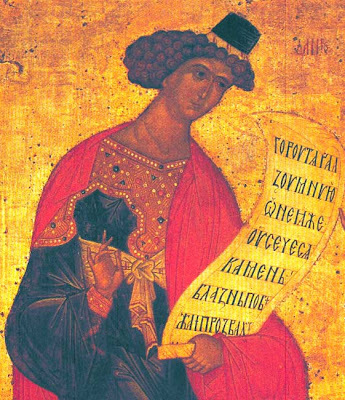 Apolytikion in the Second ToneGreat are the accomplishments of faith. 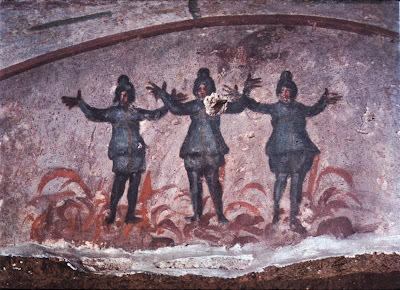 In the fountain of flame the three Holy Youths rejoiced as though they were resting by the waters. And the Prophet Daniel showed himself to be a shepherd to the lions, as though they were sheep. Through their prayers O Christ our God, save our souls. Kontakion in the Third ToneSince thy pure and hallowed heart had been made pure by the Spirit, it became His dwelling-place and clearest prophecy's vessel; for thou didst behold things far off as near and present, and when cast into the den, thou didst muzzle lions; for which cause, O blessed Prophet, glorious Daniel, we all revere thee in faith. Holy Prophets Daniel, Ananias, Azarias and Misael, intercede for us!